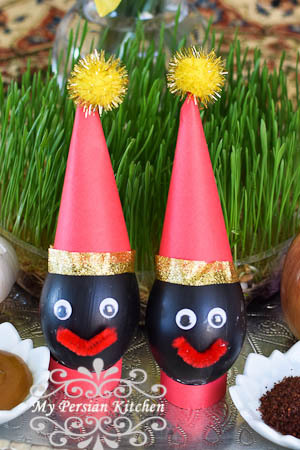 Last year my mom asked me if I had decorated my Norouz eggs to look like Haji Firouz. Of course, my answer was no, because frankly, I had not really thought about it. Maman was not shy about her pride for the Haji Firouz eggs that she had made. 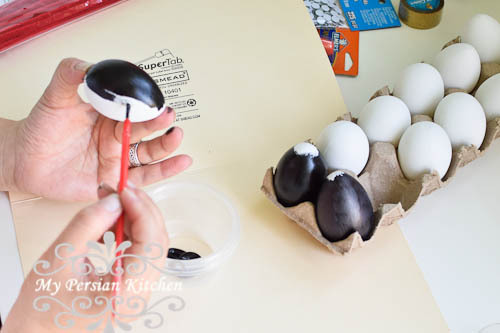 So this year, having partially run out of traditional recipe ideas for the Persian Food Bloggers’ Norouz post, I decided that I was going to dive back into crafting. It had been a very long time since I had visited my favorite craft store Michael’s to purchase goodies for a project. Part of the inspiration for this project came from a picture that I had seen a while back on Pinterest. Of course, like anything PInterest related, the outcome of the project is not as perfectly cute as the original. But you know what? 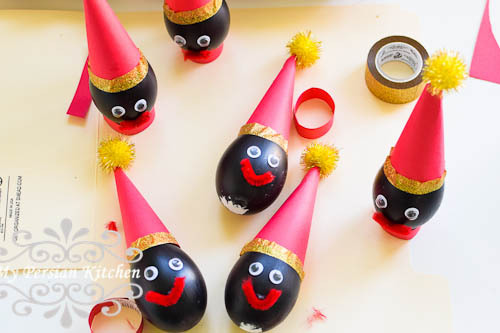 I love my imperfectly cute Haji Firouz decorated eggs! I giggle every time I look at them. Making them took a lot longer than I anticipated, but frankly, I needed to slow down a little yesterday since I woke up with a soar throat. So I spent some time strategizing the best way to tackle this project while listening to some upbeat Persian music to get me in the mood. With my snoring dog at my feet, who by the way has somehow managed to get bronchitis, I crafted away. 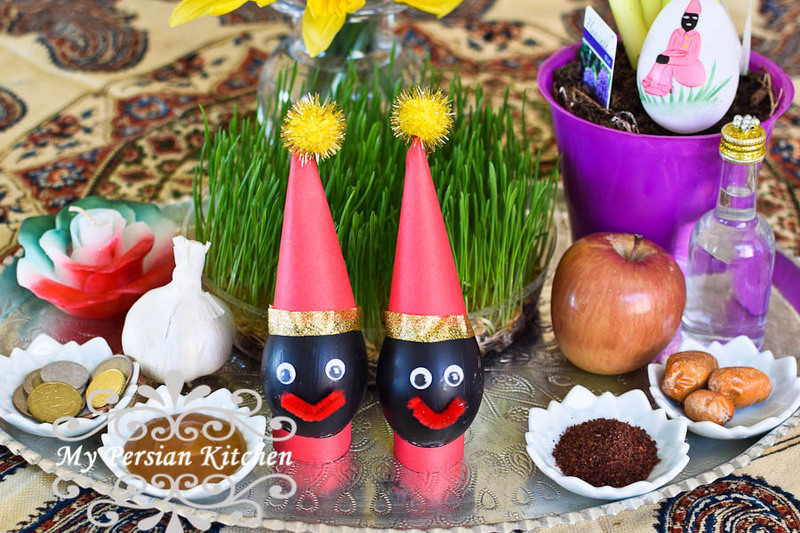 I think this is the perfect Norouz project to do with kids. 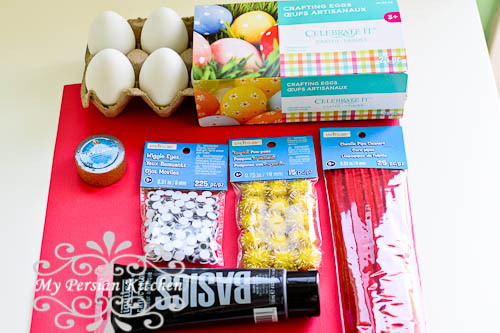 One great find at Michael’s was this package of crafting eggs. It made life much easier because I not only did not have to hard boil the eggs, but also, I was not concerned about dropping them and breaking them. 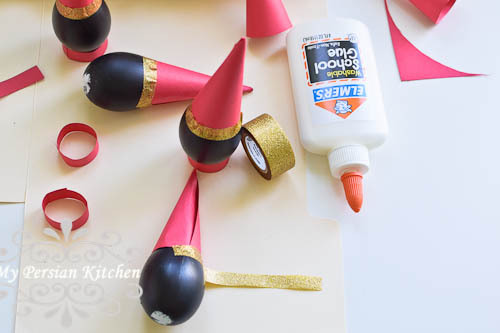 Cut card stock paper into a quarter circles to create the cone shaped hat. I cut the double sided tape in two and used it to secure the cones closed. 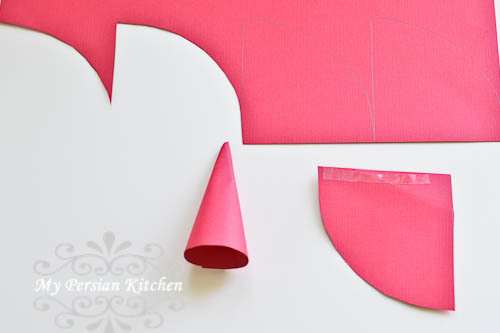 Next, cut out long rectangles and fold them into a circle in order to create the stand. Cut the Duck Glitter in half. 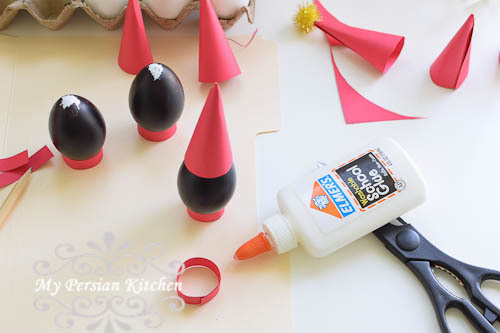 Then place the cone hat on top of the egg, then carefully go around it with the Duck Glitter so that the hat is taped on. Next glue to eyes. Make the lip using a small piece of the pipe cleaners. Finally, glue the pom pom on top of the hat. How can you not be happy when Haji Firouz is around? Below are the posts created by the rest of the Persian food bloggers, please hop on over and visit them all! These are totally adorable!! Great job, Sanam-jaan. I love craft projects. I used to do more, but then the recipes and cooking took over my life. You’ve inspired me to pickup my glue gun again! xxoxx Happy Norouz, my friend! I am so glad to see you have added a craft to our collaboration. It adds smile to the other perspective of the celebration. Truly they look lovely. Happy Nowruz to you and yours, dear Sanam! These are so adorable. You inspired me to paint my eggs this year again after using the egg shrink wrap for the last two years. Thank you Fae, I kinda ran out of traditional recipe ideas this year and also wanted to venture into the crafting part.